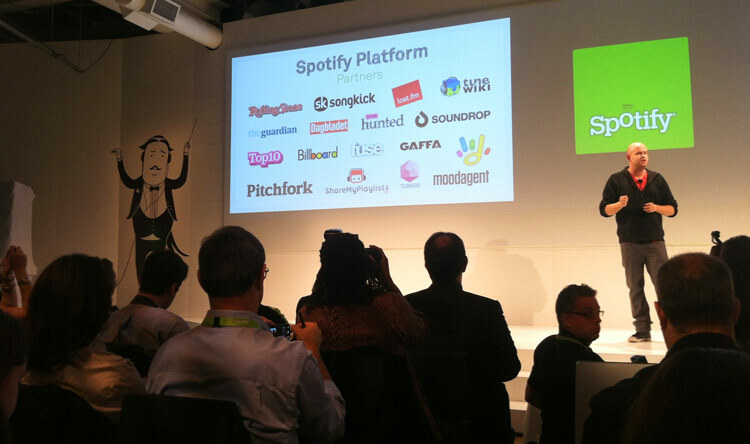 Spotify is now an app platform. At an event in New York today that is ending now, Spotify CEO and Founder Daniel Ek revealed its newest plan to edge out its streaming rivals: apps. As Facebook and so many other services are slowly doing, Spotify is planning to allow developers to make custom apps that interact with its streaming music service. Examples of apps that could appear on the service include an app that displays song lyrics, a concert app, a ticketmaster-like app that lets you buy concert tickets or merchandise, and many others. The first apps shown were Last.fm, Tune Wiki, Billboard, Fuse, Rolling Stone, The Guardian, Sounddrop, ShareMyPlaylists, Fuse, Songkick, Dagbladet, We Are Hunted, Gaffa, Top10, Moodagent, and others. The new app store will be available from an app section that will now reside on the left column, pushing down your library and playlists. Clicking on “App Finder” opens up the app store. The new apps will be available on Spotify’s Web site starting today for those who wish to try them out in beta. The Last.fm app was demonstrated on stage. The app appears to fully integrate Last.fm’s music catalog with the Spotify service, which may mean more tracks will be available. TuneWiki was also shown. This app lets you see the lyrics of a song as it plays. You can fast forward through a song and the lyrics will progress with you, making it a great app for Karaoke. Songkick allows you to see local concerts and buy tickets from within the Spotify app. Spotify is also eating its own dogfood. Ek showed off some new core features in Spotify that were built off the new app platform. One feature allows you to instantly listen to whatever your friends are currently listening to through Facebook. The CEO also shared some new stats on the success of Spotify. The service now has 15 million songs and is adding 20,000 new tracks a day. There are 10 million active users and 2.5 million of those users are paying subscribers. Spotify also made a point to say that its growth is helpful to the industry, pointing to the $150 million it has paid in royalties to the music industry and the decrease in piracy it has seen as Spotify has risen in Sweden: 33 percent of the Swedish population uses Spotify and that correlates to a 25 percent decrease in music piracy, according to the company. We’ll have more on the new service as we test it out here at the event. What do you think? Is this the best direction for Spotify? The fact that you cannot use these apps outside the desktop client goes against the mission of Spotify to put itself everywhere. Those who use Spotify on mobile or Facebook will not have access to these apps. A preview of the App Finder is available here.